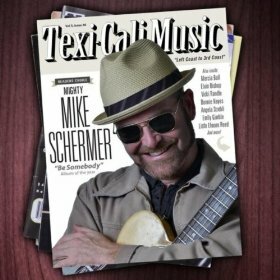 Those relatively unfamiliar with the music of Mighty Mike Schermer may know him as a member of one of Austin’s all-star groups, the Little Elmore Reed Blues Band, or as Marcia Ball’s guitarist, or as a solo artist. That only scratches the surface. With nearly three decades’ worth of experience playing the blues from his base in the Bay Area, and, since 2009, Texas, Schermer has been a valued sideman for the likes of Angela Strehli, Elvin Bishop, Howard Tate, Sista Monica, Charlie Musselwhite, Terry Hanck, and Bonnie Raitt, as well as the experienced frontman of the Soul Drivers and the Mighty Mike Schermer Band, with a number of solo albums to his credit. He has just followed up 2008’s hot Live Set with his fifth release, Be Somebody, a joyride that cuts a wide swath through American roots and soul music. “Things Ain’t Everything,” up next, dispenses solid wisdom. Clavinet, organ, and wah-wah guitar accent a deliberate, syncopated groove that is part Meters, part P-Funk, and extremely greasy. The shuffling “Corazon,” recorded with his Little Elmore Reed bandmates, comes together over Lewis Stephens’s honky-tonk piano and features Elvin Bishop’s keening slide guitar. Schermer himself handles the slide on “My Baby Only Loves Me When She’s Drunk,” a country-leaning roadhouse number, also cut with the Little Elmore Reed crew. “Someday” delivers a rootsy blast with some of the R&B-blues hybrid feel of Freddy King’s early sides. Schermer’s guitar cracks like a whip over the rockin’ rhythm laid down by Ronnie James and Damien Llanes. The melodic, languid “In My Mind’s Eye” introduces Schermer’s soulful side; his guitar solo is restrained, yet shows quirky personality in its phrasing and attack. The easy-going “Stickin’ To You” mines the same vein. Llanes and James create an infectious bounce on the unabashed plea “Got To Feel Love,” another soul-kissed cut with a more contemporary feel and a suggestion of reggae in the mid-song breakdown and Dale Ockerman’s swirling organ. The same lineup swings the swinging, uptown blues “Keep Reachin’ For The Top,” with the organ high in the mix and Schermer conjuring the stinging, ice-cold style of his early inspiration Albert Collins. “Do Me Like That” is a lilting number that unmistakably evokes the memory of Sam Cooke. Its stripped-bare arrangement–saxophones by Thad Scott and “Kaz” Kazanoff over the rhythm put down by James and Llanes–is quite lovely. A similar feel informs “Lonely Hearts,” which retains the saxes, adds Austin de Lone’s ethereal electric piano, and replaces Llanes with Paul Revelli. “Over My Head,” cut from the same cloth, sports a busier soundscape, with Paul Revelli and Steve Ehrmann’s rhythm augmented by organ (Stephens), piano (de Lone), and saxophone (Nancy Wright). This kind of material really suits Schermer, who is equaled only by James Hunter in shaping a modern-day version of proto-soul. Schermer has a wonderfully unforced and natural singing style that is just right in soul, blues, and roots contexts. A confirmed Telecaster man, he dials in a guitar tone that’s punchy and appealing; his often surprising playing is conversational, highly melodic, and always fitted to the song. His well-crafted songs invariably set their melodic hooks deep; the arrangements clearly receive loving attention. All these elements come together in a natural, easy, and uncontrived manner. Be Somebody offers a dozen compelling reasons to get acquainted with Mighty Mike Schermer, someone of taste and talent.